San Francisco is an amazing city, full of life, energy and things to see and do. Simply spending a few days or even weeks exploring the city without a plan will bring you to many wonderful spots, and around every corner there is a new surprise awaiting you. However, if you are one to plan things, here are our top 5 must-see spots. 1. The Golden Gate Bridge will be an inevitable spot which you will see. The Golden Gate is one of the most famous bridges in the United States, if not the most famous. It is free to walk or cycle over but motorists must pay a small toll to cross this old bridge which was completed in 1937. It took seven years to build, and the statue of its creator, Joseph B. Strauss, is found on the southern observation deck. 2. Alcatraz Island is another of the city’s emblematic sights, one which no one used to want to go to, as it once was a prison, but is now a much visited place. You can take a ferry from Fisherman’s Wharf and then enjoy a guided tour around the island to find out what it was like to live there as one of the its prisoners. 3. Take a trip on the city’s cable cars to enjoy an experience which is more than just a mere form of transport. Normally packed with tourists, a trip on a cable car may not be everyone’s piece of cake, but nonetheless, the cable cars are so much a part of San Francisco that everyone must have a go. At the end of the line, you can catch the gripman and the conductor turning the car around manually. 4. Chinatown in San Francisco, which is easily reached by the cable cars, is a fun and energetic place to visit, though don’t expect to be the only tourist there. In recent years Chinatown has gotten increasingly touristy, but it is still certainly a must-see sight. San Francisco’s Chinatown is the largest and the oldest in the U.S.A. Right by Chinatown is North Beach, which is also known as Little Italy, with European style cafés to give that essence of Rome. 5. 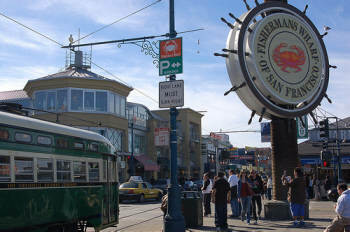 Fisherman’s Wharf is where to catch excellent shows by street performers, eat fresh and tasty seafood, and visit the Fisherman’s Wharf Wax Museum. From the wharf you can visit both Alcatraz Island and Angel Island, also known as the “Ellis Island of the West”, which is now a large, open park. I just got back from visiting San Francisco for the first time. I did everything above except go to Alcatraz.